The smallest filter of its type. Optionally, a carbon cartridge (for medical treatment and crystal-clear water) and an anti-phosphate cartridge (to prevent the growth of algae). Ideally suited for tanks with a capacity of 10-40 litres. Hang-on (cascade) filters combine the advantages of internal filters and external canister ones. While easy to install, they offer high performance and versatility of use. Such filters are suited equally well for large and small aquariums. The new tiny VERSAMAX (FZN) MINI filter by AQUAEL is designed especially for small tanks. AQUAEL VERSAMAX MINI is intended for the filtration of water in nano-aquariums, shrimp aquariums, and other tanks with a capacity of 10 to 40 litres. It provides efficient water filtration, eliminating visible contaminations. Additionally, by causing a gentle motion of the water surface, the device ensures efficient aeration, increasing the oxygen content in the tank. Thanks to an external smooth performance controller, you will not have to put your hands in water in order to adjust performance to the capacity of the tank. 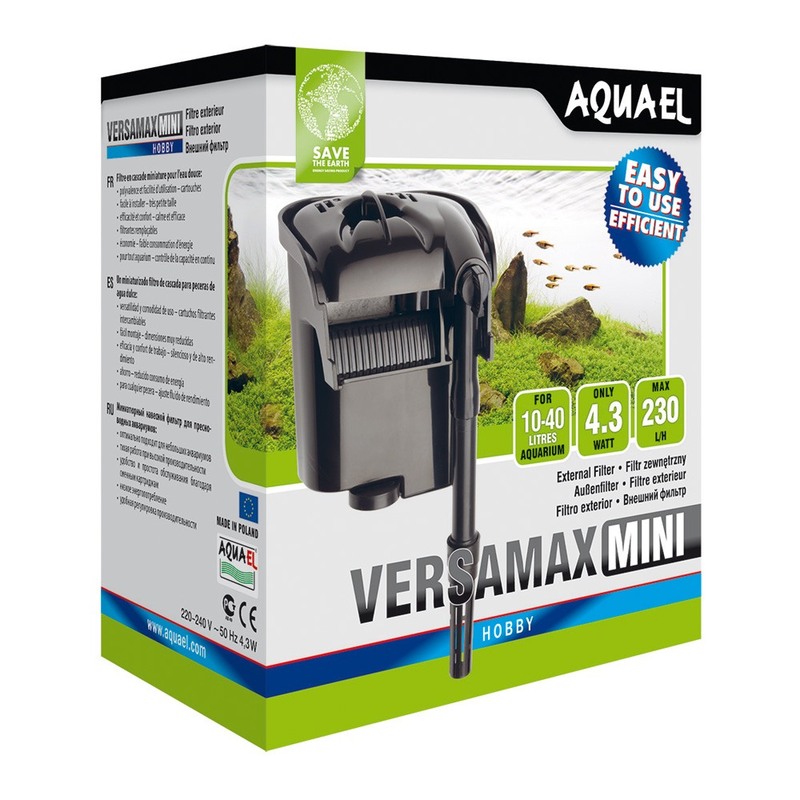 The AQUAEL VERSAMAX MINI filters are delivered with a replaceable sponge/ fleece cartridge. The cartridge can be replaced with optional filtering media, e.g. activated carbon + sponge + fleece or sponge + phosphate absorbent + fleece. The optional cartridges are purchased separately; they allow you to adapt the filter to the specific requirements of your aquarium.